Winter is a great time to get outdoors and explore Rocky Mountain National Park (RMNP). Whether you head out for a snowshoe or winter hike in RMNP depends on how much snow has fallen recently. Either way, exploring Rocky Mountain National Park in winter is wonderful. 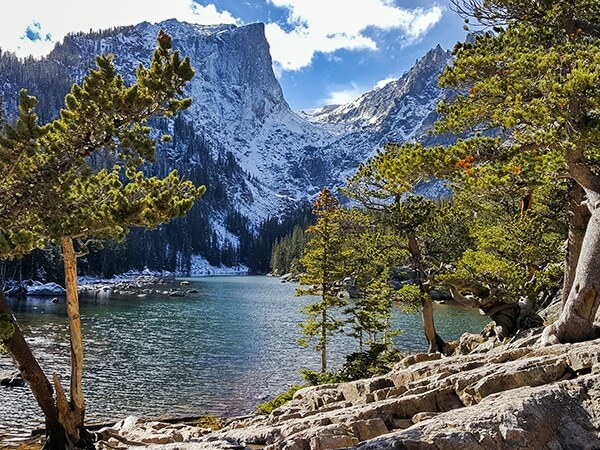 Snowshoe past frozen lakes, white-dusted trees and snow-capped towering peaks, and enjoy the breath-taking scenery that you can only see on these winter hikes and snowshoes in Rocky Mountain National Park. To enjoy some of the best snowshoeing in Colorado, prepare for the cold and check in with the RMNP Park Service before your start your snowshoes.  You will receive the daily update of the best snowshoe trails in Rocky Mountain National Park, so you can choose a trail to avoid avalanches and hypothermia. 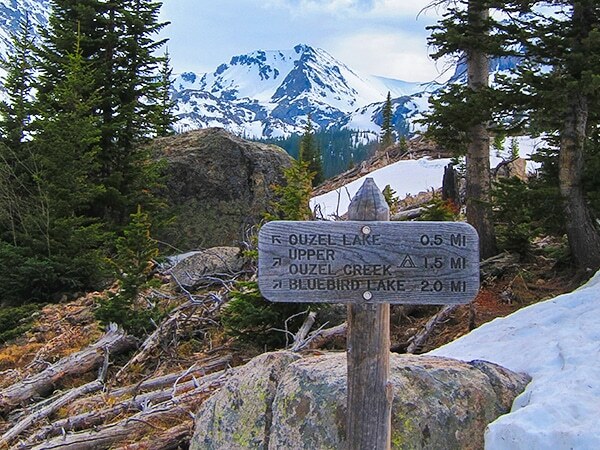 Below are the 10 best winter hikes / snowshoes in Rocky Mountain National Park. 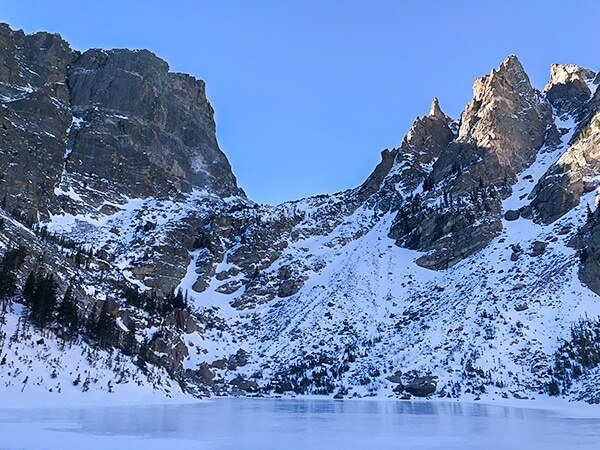 For some of the best snowshoeing in Colorado, start with Dream Lake. While you rest on the shores of the ice-filled alpine lake you will have a clear view of the 3877m high Hallett Peak. 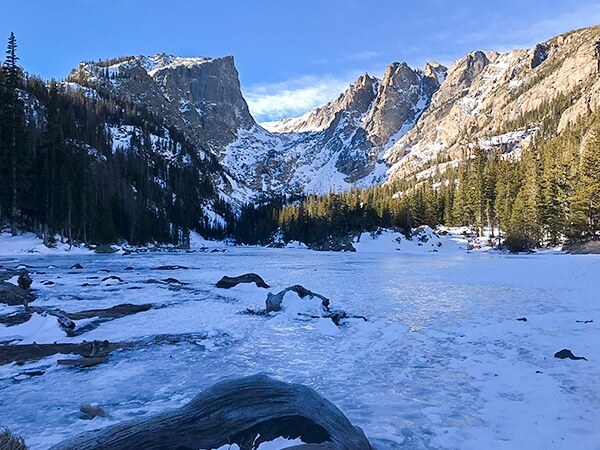 We think this is not only the best winter hike in Rocky Mountain National Park, but one of the best winter hikes in Colorado. It’s also a great winter hike to do with kids. 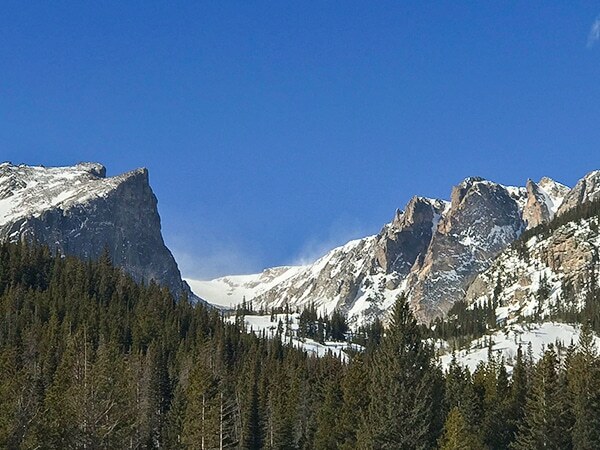 Another top winter hike in Rocky Mountain National Park, this trail takes you to see Hallett Peak and Emerald Lake. Lake Haiyaha will be frozen a deep blue when you reach it on one of the best winter hikes in RMNP. Like a gem set in the surrounding crags, this is well worth the hike, especially in winter. 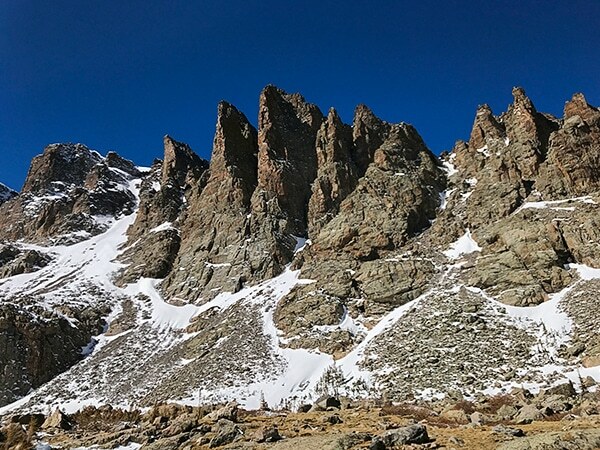 It definitely is one of the best winter hikes in Rocky Mountain National Park. Another frozen lake in RMNP that is well worth the effort to see. You will see the famous Diamond on Longs Peak. 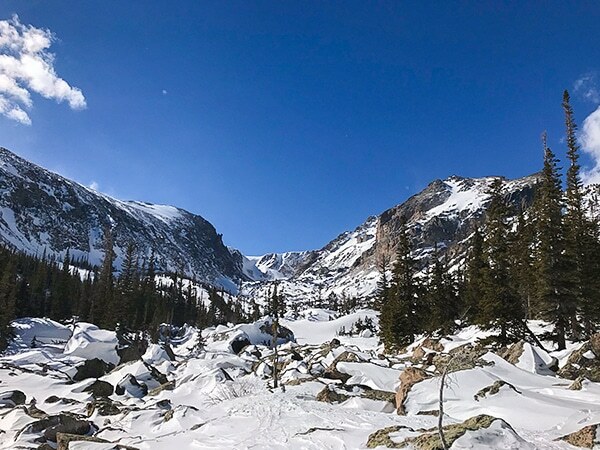 Chasm Lake is our favourite snowshoe in Rocky Mountain National Park for intermediate to advanced snowshoers. Another of the best snowshoe trails in Rocky Mountain National Park goes to Sky Pond. Locals enjoy this trail, which leads to an alpine lake at the base of The Sharkstooth, a row of sharp peaks resembling shark’s teeth. You may see frozen waterfalls along the way as this trip offers some of the best snowshoeing in Colorado. Where Andrews Glacier and Taylor Glacier meet in RMNP is The Loch. The snowshoe trail is mostly level and easy and there are several places to rest. The views when you get to The Loch make it clear why this is one of the best snowshoe trails in Rocky Mountain National Park. 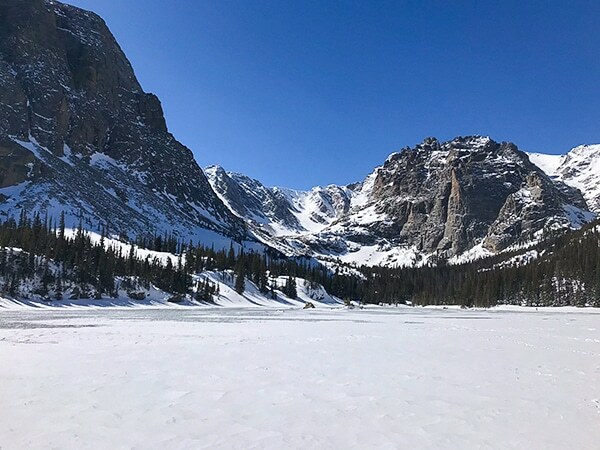 Ouzel Lake is the end-point of this great snowshoe trail in Rocky Mountain National Park, however the destination is not the main attraction. The amazing views of RMNP along the way and several frozen waterfalls make the journey the reason to go. This is definitely the best winter hike for beginners in Rocky Mountain National. This is an easy winter hike and Nymph Lake is a beautiful destination. 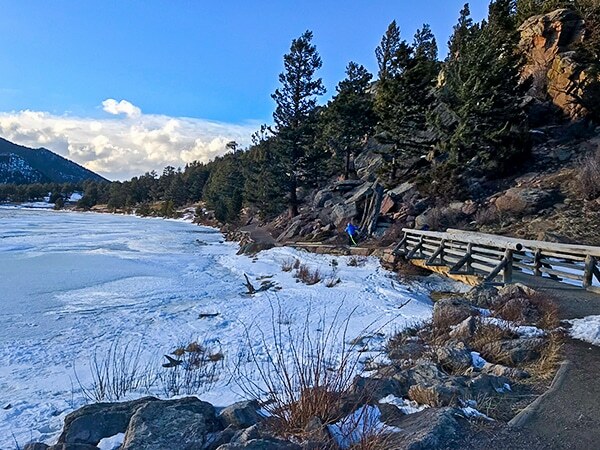 Bear Lake is another winter hike in Rocky Mountain National Park that’s great for kids. It is a short loop with beautiful scenery. 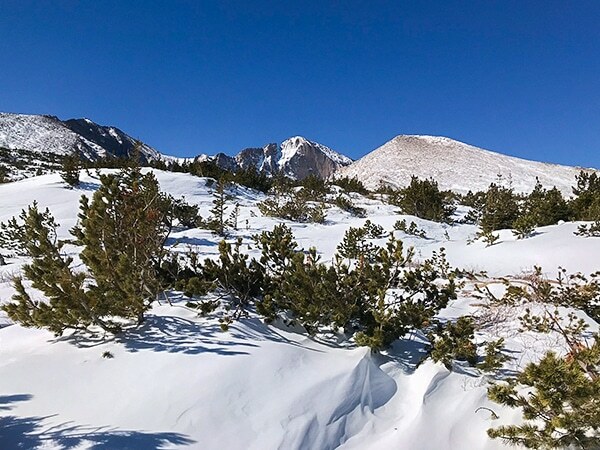 You can view the famous Diamond on Longs Peak when you take the Lily Ridge Trail, one of the best winter hikes in Colorado.